If you are looking for a mole trap with a simple design, this will be the perfect choice for you. It is made of durable rust-free steel. In order to use it, you have to push the closed jaws of trap straight down into the tunnel created by the mole. When the jaws are buried completely on the land, you have to step on the lever of the trap. 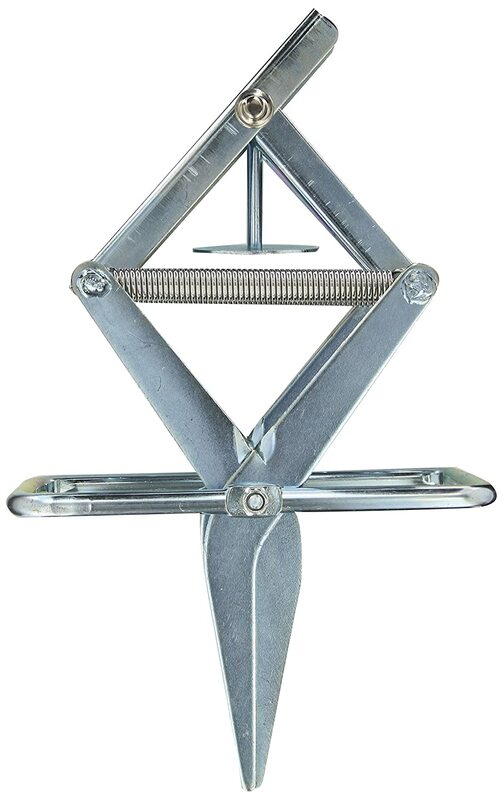 This will trigger the trap to open and prepare the jaws for hunting. Unfortunately, since moles are smarter than you think, if you do not clean the trap thoroughly, they can smell it and instead of passing right through it, they will dig a hole to avoid the trap. Aside from that, many users have claimed that it was difficult for them to catch a mole even after weeks. 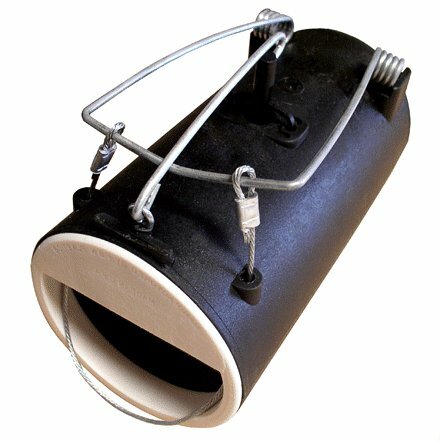 This is a product that can trap different kinds of rodents: rats, gophers, moles, and others. Unlike others, this product is a great nuisance catcher since it becomes a part of their normal way. The only thing that hinders some users to enjoy this is its complicated set-up. To be able to successfully catch a mole, you have to prime your trap with loose dirt. The aim for this is to hide the noose and serve as a flooring to the trap. Also, in using this, you have to ensure that the trap is well-ventilated. This gives a more ‘natural’ pathway for the moles. Locate a mole mound and bury your open tunnel. It is advisable to spade sods and keep them; this will be used once there are moles caught in the trap. Do not forget to seal cracks with loose soil. Moles will not enter the trap if they can see a light. Placing a carrot to the vent hole is also recommended especially if you have a strategic pest. Some mole traps become ineffective because they are not compatible with the soil. That would not be a problem if you will buy Victor Out O’Sight Mole Trap. It has a powerful mechanism that gets triggered as the mole pass through the closed tunnel. Trapping moles successfully depend on the proper placing of the device. Primarily, you have to locate the tunnel created by the pest. Carefully measure the mole trap and dig a hole that is the same or smaller as the size of the trap. Ensure that the trap will be perfectly placed in a vertical position. Using loose soil, build a mound to hide the trap. And release your safety hook. Setting the traps is easy, you have to draw the levers together and place the locking bar on the trigger pan. Loop the safety hooks around the legs of the mole trap. Remove the levers and strategically place the trap in the runway. Once placed properly, release the safety hooks. 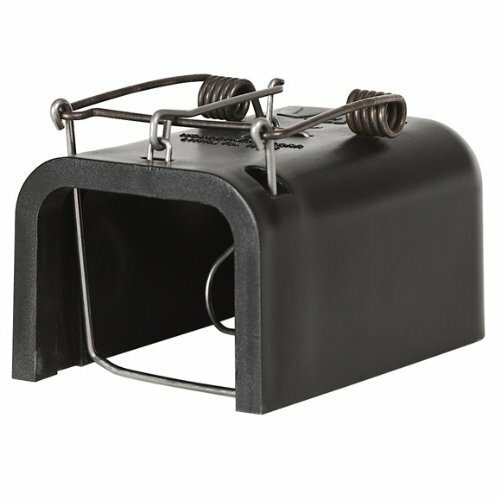 Wire Tek 1001 EasySet Mole Eliminator Trap is one of the highly recommended pest killers by users. It has a very simple design without any sharp legs exposed. Another thing that gave this product a huge plus is that it is manufactured in the USA. If you do not want to add any further disturbances to the soil, this product is perfect for you. Unlike other mole traps, you do not have to dig the land in order to install this. This is highly preferred by organic farms. This trap does not also require complicated setting-up. In only a few steps, you can start hunting and killing down those pests that destroy your soil and put your plants in peril. To begin, you have to find tunnel holes created by the uninvited rodents. Afterward, you insert the closed jaws in the middle of the tunnel’s length. 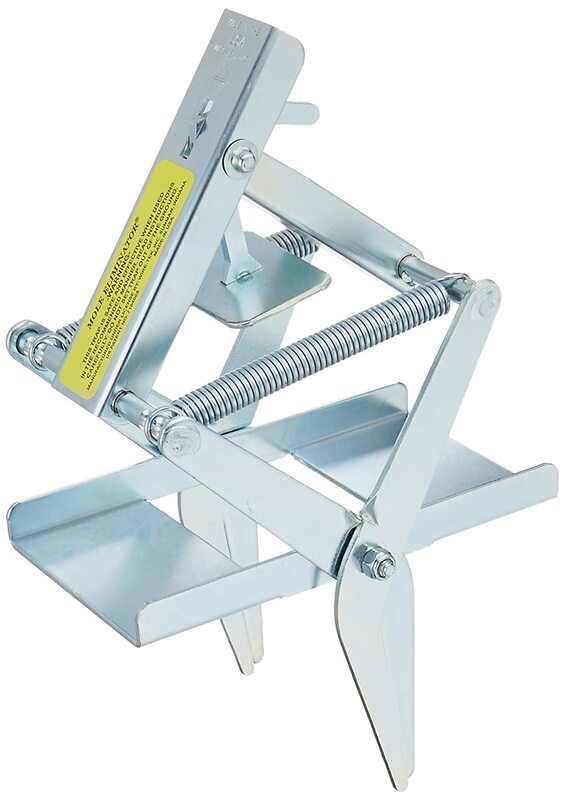 Check the base of the Easy Set Mole Eliminator Trap; it should be firmly placed on the ground. Once you are finished with everything, all you have to do is to step on the setting lever. This will then activate trigger mechanisms which will collapse and kill the moles as soon as they pass through it. If you are going to compare this Woodstream Gopher and Rodent Trap with the others on the list, this is by far the most ‘comfortable’ trap of them all as it provides a spacious room for the mole while waiting for its death. Although that could also be a con since you will have to dig up more land to place it properly in the ground. The rodents will not be able to chew the container no matter how hard they try. It has a different style of trapping your pests through its choker loop-style. 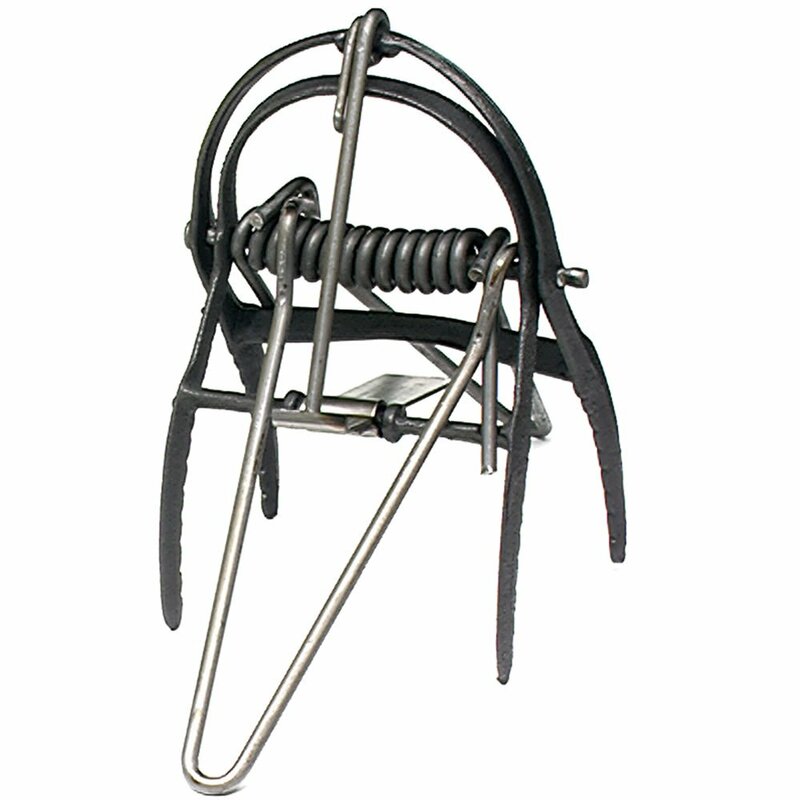 The trap is made of durable materials such as galvanized steel loops. It is also weather-proof; it means that its effectivity is still present even during rainy season. Lastly, since it is not like other traps that need to stand in soil, it’s efficiency does not rely on the type of soil in your area. When it comes to gardening, moles are not like other pests because they do not harm the plants intentionally. What they do is that they feed on insects in your soil. In fact, they could be beneficial because they eat up soil pest and they normally like to stay in a land filled with organic matter like compost﻿s. Now, what could be the problem with that, you may ask. Moles dig soils and the holes they create under the ground make the less compact. This will make your landscapes fragile and easy to corrode in the long run. On top of that, they can damage the roots and foundations of your plant. Moreover, they make easy and open access to the plants which other pests could make use of. Esthetically, no one would like mounds of dirt that look like small mountains on their lawn. If you fail to check and remove this, it will make bald spots on your lawn as the grass will not grow properly on the area. Moles do not only damage the arrangement of your soils, they can also destroy driveways, pools and concrete slabs which could give you expensive renovation bills in the long run. Replanting the entire lawn or even patching it up may necessitate you to shell out money as well. Most of the buyers would appreciate products if they are simple. It should be user-friendly. Complicated ones will just waste time. Imagine the time misused when you keep on assembling the parts every time it misses the mole. Another main issue is the ease of cleaning. Cleaning it is highly important or else the mole will just avoid it. You should be able to identify the ratio of hits and misses. Do not waste your hard-earned money by buying traps that are way too sensitive that it misses the right target. Similarly, a trap that could not sense anything is also worthless. Always go for a dependable tool. You have to understand that the proficiency of a certain trap can also depend on the type of soil in your area. Some areas are so compatible with a particular type of trap. You might want to ask your neighbors about the products they use. Others prefer traps that are exposed since they can easily rinse it with pressured water. On the other hand, some gardeners opt to buy containers because it hides the mole in sight. Others prefer the cage or trap that does not kill the pest. For the ones that kill the mole, on the other hand, you just have to regularly check of there is a rodent trapped already because it will smell bad. I have seen a number of discussions on the World Wide Web about the controversial instructional methods of mole traps. Others claim that the guidelines given by the manufacturers are faulty. Some users have their own technique on how to make the trap catch more moles. Nevertheless, try to spend some time to study the tool. Learn the basics of each of the part of the trap and employ different strategies in installing the product. ​Last but not the least, the most important factor for me would always be safety. Get a mole trap that will eradicate unwanted moles but would not hurt you, your guests or your pests. Check for pointed corners or trap parts that are exposed. Inspect the mechanism of the trap. Make sure that the parts are securely installed so that it would not cause cuts or wounds when you remove the trapped rodent. With the given choices for mole traps, I would give my 5-star rating to Wire Tek 1001 EasySet Mole Eliminator Trap. There are so many reasons why I gave this product the highest number of stars. First of all, it was reported to be the most effective one on the list. On top of that, you do not have to dig the land to install the apparatus. Even without this process, it does not decrease the chances of trapping rodents efficiently. The equipment is very easy to set up and in no time, you can initiate the trapping process. You will also not doubt the quality of this product since it is manufactured in the United States of America. It is made of materials that enable the trap to have a longer lifespan. Lastly, compared to other exposed mole traps, this is the least dangerous of them all. This is because there are no sharp legs or parts of the trap that are exposed. For this reason, you do not have to worry about the safety of your pets or your children.